Soros-funded ‘civil society’ organizations currently operate throughout Africa, where pseudo-pan-Africanist and anti-imperialist rhetoric is being invoked to overthrow entrenched leaders who have, for the most part, facilitated Vincent Bolloré’s rise to prominence. Paul Biya in Senegal, Abdoulaye Wade in Senegal, Ali Bongo Ondimba in Gabon, Denis Sassou-Nguesso in Congo Brazzaville, Joseph Kabila in the Democratic Republic of Congo, Blaise Compaore in Burkina Faso, Laurent Gbagbo of the Ivory Coast, Pierre Nkurunzizza of Burundi — all have been targeted by the agencies of Soros. Some of the leaders such as Pierre Nkurunzizza have done a remarkably good job at stabilizing and developing their countries. Others have been mediocre. But what many of these leaders have in common is that they are not considered ideal regional prefects of the global empire, the emerging World State. In 1994 Rwanda was invaded by the Rwandan Patriotic Army (Forces Patriotiques Rwandaises, FPR). The army was led by Major General Paul Kagame (pictured) and was the culmination of a low-intensity terrorist campaign conducted from the RPA’s bases in Uganda from 1991-1994. Kagame was a member of the Tutsi minority who had been exiled after the Hutu revolution in 1958 during the colonial period; the Belgian authorities favored the taller, light-skinned Tutsis over their Hutu counterparts. Until the violence of the 1990s, Rwanda had been a French and Belgian zone of influence in Southern Africa. 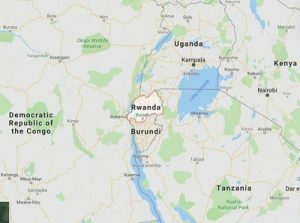 However, American, Israeli and British mining corporations wanted to gain control of the mineral-rich Great Lakes region (ER: to the west of Rwanda – see map), and Paul Kagame, at that time an intelligence officer in the Ugandan Defence Forces, would be their man. Kagame was trained by the Pentagon in Fort Leavenworth, USA. During his sojourn in America, he forged close links with President Bill Clinton and other top US officials. Michel Roussin (pictured), a high-ranking French intelligence officer, was in the region at the time. 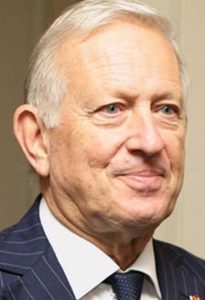 A member of his team admitted that the French government were delivering arms to the Rwandan Armed Forces, who were defending the country from the US/Israeli-backed FPR of Paul Kagame. But imperialism is not finished with the region just yet: globalist networks in the EU and the United States have been destabilizing neighboring Burundi (see map above) since 2015. Media lies have been one of the main weapons against the country. The Burundian government have taken the France 3 Television to court for lying about the conflict. France 3 has admitted lying and have apologized. The tension between Hutu and Tutsi in Burundi is stoked by international agencies. The country is a strategically important state for control of Central and East Africa, where the West is challenging Chinese interests. Kagame’s regime has imposed English as the official language of Rwanda. 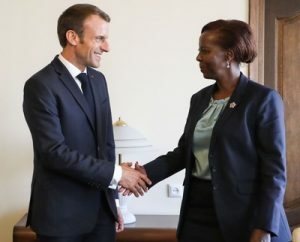 As if in an attempt to drive another nail into the coffin of French, in October 2018 President Emmanuel Macron nominated Rwandese Louise Mushikowabo (pictured) as head of the Organization of Francophonie. It is part of Macron’s determination to subordinate France to Anglo-Saxon globalist interests. In the next segment of our series, we will explore just what is at stake in the destruction of France, and why ideological and cultural differences among the ruling class are largely, though not exclusively, the consequence of an underlying material reality.